Anthropomorphism n. Attribution of human motivation, characteristics or behavior to animals, objects or natural phenomena. If Max could only speak, he would say "I'm NOT going!" 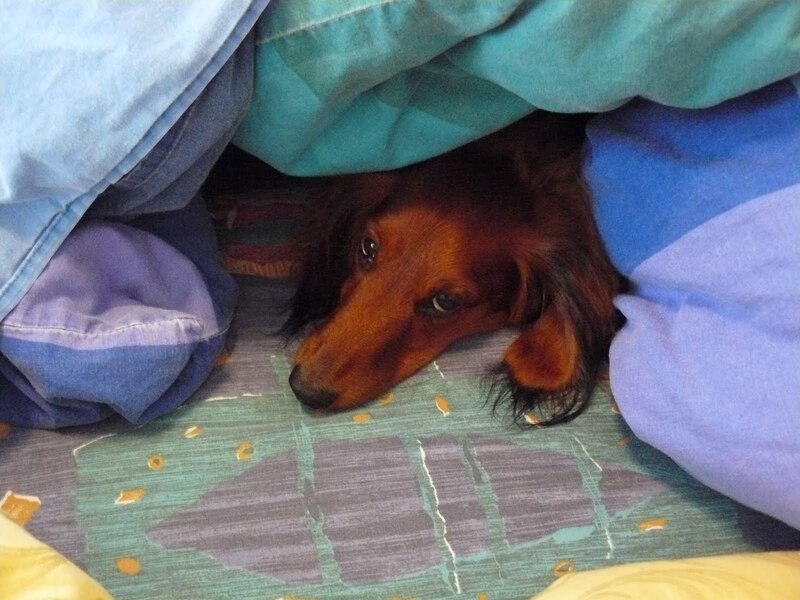 He burrows into a pile of comforters on our bed, and looks at me soulfully as I stand over him with hands on my hips. Meanwhile, Eddie's already curled himself up into a ball underneath the armoire. The dogs go to daycare on days when I teach cooking at home. Those who are familiar with the breed know that Dachshunds are sweet, funny and lively dogs who immediately form a loyal attachment to their family. So when strangers come into the house, our little watchdogs are intimidating with their loud, persistent bark. Max and Eddie have just started at daycare, so my dogs still aren't sure why they have to spend hours away from home, and with strangers - the four-legged kind! Each "parent" takes a diary home, with a daily update on their pets. Yesterday's entry said, "Max and Eddie spent all day following their handlers around. They don't really play with the other dogs, but we are encouraging them to develop social interactions." The Montessori of Doggie Daycare! This is one recipe I taught at class yesterday, using the original ingredient of Red Snapper fillets. I substituted the fish with chicken breasts when I made it for dinner, as seen on the photos. I would recommend using Red Snapper, Halibut or Cod fillets, though, when you do this recipe. It's delicious! 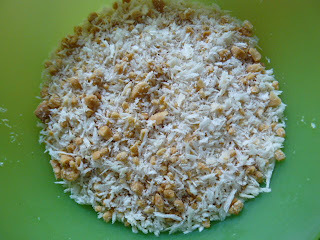 Combine peanuts and panko in a bowl. Rub fillets with 1 tablespoon of oil, season with salt and pepper. Dredge in crumb mixture to coat one side thoroughly. Heat 2 tablespoons of oil in a saute pan until very hot. Add butter and let foam (should brown but not burn). Saute the fillets coated side first until golden brown. Flip over and place in an oven. Cook until fish breaks apart easily when lightly pressed, 5-10 minutes depending on thickness. 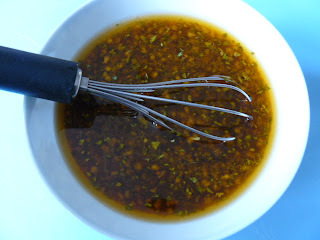 Drizzle with Soy Vinaigrette. 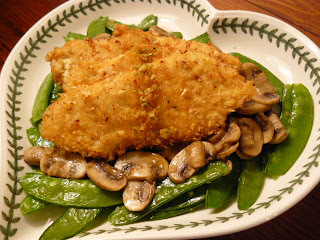 Serve with sugar snap peas or favorite vegetable. *If you use chicken breast fillets instead of fish (or if you want to coat a fillet on all sides), please remember to dip the chicken in beaten eggs before coating in bread crumbs. In a bowl, combine all the ingredients except sesame and peanut oils. Slowly whisk in the oils. Season to taste with more vinegar and/or sugar. ok, i need to try this out. i have chicken breast in the fridge but what's "panko" bread crumbs??? oops, sorry guys, "panko" is japanese bread crumbs, which has bigger flakes and gives a nice crunch. hi tita Annie!..more pics of Max and Eddie!..aww..they're so cute!..wish i could see them in "person"..any chance you could bring them to manila? ?..LOL..haha..by the way, the fish fillet looks GOOD..wow..
Nins, it's easy to make too! Try it! Annie, why coat only one side of the fish? What happens if I coat both sides? Leng, for this recipe, the original fish used is a meatier, thicker cut of fillet like halibut or sea bass or snapper. Coating one side (top) only would be enough, as you want to highlight the rest of the fish. If you use ordinary thin fish fillets, then coating all sides with the breadcrumbs is fine. I was planning to use my skinless/boneless chicken breast like Marie Antoinette. Will it be just as good? Obviously, it'll take a longer time to cook, right? I just bought a bunch of chicken breasts from Costco and want to do a variety of dishes with them. Leng, I made this recipe twice - first with a red snapper fillet, coating only one side. the second time i made it with chicken breast fillets, coating all sides, and it was also delicious with the soy vinaigrette. i would suggest slicing/pounding the chicken breasts to about 1/4 inch thick before coating. That's good. Now, I'm looking forward to preparing it and serving it for my family. Thanks, Annie, for your tips. Oh remember when you use chicken breast fillets for this recipe to dip it in beaten egg first, then the crumb mixture so it coats and sticks to the fillets.